Fringe, referred to as bangs in American English, are a shaped cutting of the front part of the hair so that it is combed forward and hangs or curls over the forehead. Fringe hairstyles are a great way to get a fresh new look without changing your entire hairstyle. Not everyone wants a drastic new look, but if you want to tweak your current hairstyle just a bit, then a new fringe hairstyle is for you. Fringe hairstyles can range from a full fringe look or you can get a subtle look with fringe by adding in pieces that blend in with your layers like the look below. 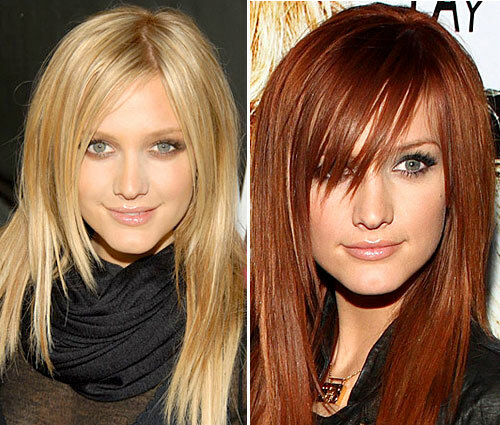 There are so many options with a fringe hairstyle, that you really can’t go wrong. Moreover, both these fringed haircut styles are quite versatile and flexible and hence, it can suit to almost all the face shape and facial structures. When you go for fringed hairstyles, make sure that the style adds a distinctive softness to your face and brings around and illusions of extra width to your hair. i love number 3 on the red head. i am going to get my hair cut like that this weekend!